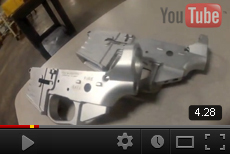 UHP15-SSA AMBI Lower Receiver- COMING BACK SOON! The Cross Machine Tool UHP15-SSA Lower receiver is the perfect way to start your Rifle.. The UHP-15A Ambi Lower receiver features the addition of an Ambi Bolt release & an Ambi Mag R..